In this edition of our Sustain U series, we will discuss the difference between PAR and BR light bulbs, as well as touch on how bulb selection can help you save energy. At the end of the blog, check out a bit on a new wave of LED PAR and BR bulbs! What does “PAR” or “BR” even mean? PAR stands for Parabolic Aluminized Reflector. BR stands for Bulged Reflector. What does the number after PAR or BR mean? What is the difference in construction? PAR bulbs are incandescent, tungsten-halogen, metal halide (some even now have LED replacements, which we’ll touch on later), and have a hard glass cover which is hermetically (airtight or impervious to air or gas) sealed to the reflecting surface. Inside are precisely placed lenses that controls beam spread and cannot be altered in position in relation to the filament. These items’ positions cannot be adjusted or altered in any way. There are flood bulbs and spot bulbs. Flood bulbs diffuse or scatter light, while spots focus all light in one direction. BR bulbs are a common reflector lamp, with a bulged reflector. They’re incandescent or electric discharge (as well as LED replacements, but that’s for later!) bulbs. The sides of the outer part of the blown glass bulb are coated with a reflecting material that directs light. The light transmission pattern can be clear, frosted, or even patterned. That all sounds great and everything, but where do I use them? A common misconception is that PAR bulbs are only meant for the outside, like in corner “emergency light” applications and that BR bulbs are superior for the indoors. This is false. It really comes down to what application and what you desire for the light appearance. In reality, PAR bulbs have better photometric qualities due to their brightness and light temperatures. They’re also shorter bulbs, allowing them to sit higher in the fixture than a BR bulb. This makes the bulb harder to see (which is desirable), and reduces unwanted glare. Now—that doesn’t leave BR bulbs without their advantages. The frosted/patterned coating on BR bulbs may create a desired room appearance. PAR bulbs also tend to be a little harsher when it comes to where the light starts and where it ends, due to the way their reflective surface and lens are situated. The lens doesn’t allow light to spread much further than the angle of the beam spread. BR bulbs tend to have a more gradual “fade” in light as the light reaches the outer limits of the beam spread. BR also produce less shadow than PAR bulbs. 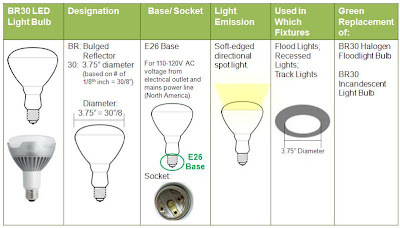 In the scheme of things, modern PAR or BR bulbs can be used in a variety of applications. In the past you had to spend time finding an outdoor bulb that was resistant to moisture. Modern PARs make it rather easy to find such a bulb. PARs are still typically better suited for the outdoors than BR or R bulbs are. When it comes to the indoors, it really is all a matter of room appearance. Both are usually considered for use in track lighting, recessed lighting, or as flood lights. BR or R bulbs are often used in common areas and hallways. You see PAR can lighting in some home theater applications. However, these can be entirely switched around just depending on how you want the lighting in your living areas to appear. Keep in mind the “soft edged” lighting of BR bulbs versus the “hard edged” beam spread of PAR bulbs. At Conserv-A-Store, we have a selection of great long-life bulbs that reduce bulb changing costs and allow you to enjoy the highest quality lighting. Many of them have 20,000 hour ratings, preventing you from having to change the bulbs often, not to mention preventing you from having to buy them often! These incandescent flood bulbs can be found here. Conserv-A-Store has also recently gone under remodeling as far as our LED bulbs are concerned. We’ve added many AMERICAN MADE LED bulbs, all with tremendous hour ratings, bulb life, and all with a warm white light temperature—the closest you can get to incandescent lighting. There are several bulbs with 50,000 hour bulb ratings, and many are energy star listed. Think about it this way; there are 8760 hours in a year. If you run one of our LED bulbs 6 hours a day, that’s 2190 hours per year. Here in Orlando, we’re charged 11 cents for every kilowatt-hour. There are 1000 watts in every kilowatt-hour. We have an LED flood bulb that is a 15 watt bulb. 1000/15=66 hours you would need to reach 1 KwH of usage. 2130 hours in a year/66 hours per KwH = 32.27 KwH used in a year. 32.27 KwH x 11 cents per kilowatt-hour = $3.55 PER YEAR! That’s less than four dollars a year to run that bulb! For those of you that aren’t the analyticals, we apologize for the math. But that’s a cheap bulb to run! Our LED bulbs can be found at this link. While we’re talking about LEDs, here’s two charts showing some differences between LED PARs and BRs to help you decide what may be best for you. We hope we helped you in your search for the answers. Should you have any more questions about PAR vs BR lighting, or have a suggestion about another topic we should cover in our blog series, please drop us a line. You can contact us at info@conservastore.com any time. Thanks for reading! Here’s to going green! Visit our Conserv-A-Store Long Life and Long Lasting Incandescent and LED Light Bulbs page were you can find and buy the long lasting bulbs we have available. The Conserv-A-Store Sustain U series is our attempt to teach you a bit about how going Green can be a regular part of life and usually will not cost you more, especially when return on investment is considered. We welcome any suggestions on a Sustain U topic you would like us to investigate and blog about. Conservastore is your Green Products Superstore found here at Conservastore.com-come give us a look; we think you'll be glad you did.